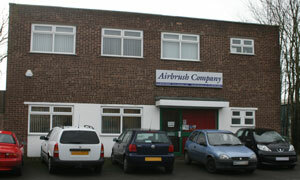 The Airbrush Company has a 70-year family history in airbrushes. Established in 1947, the company was then known as Connor Patents Ltd, when the revolutionary Conograph airbrush was launched. 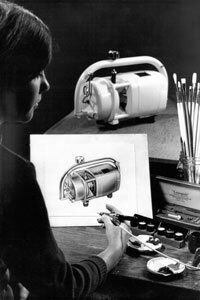 In 1952 the company changed its name to Conopois Instruments Ltd when artist, engineer and inventor Arthur Albert Connor designed the Conopois airbrush, which had a unique ergonomic dual-action top lever. All the airbrushes were hand-made by Arthur so the waiting list became quite long as word of mouth got around amongst graphic artists and ceramics restorers that the performance of the airbrush was so good. Arthur's daughter Rosemary started to help her father making parts for the airbrush from the age of 10. In her late teens Rosemary studied art at college and then worked as a graphic artist and illustrator for a research institute for about five years before having children. 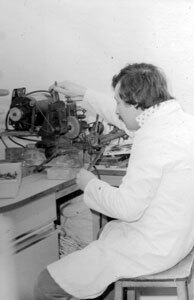 In 1978 she went back to work for her father, making the finest parts such as the nozzles, hand-turning these on a watch lathe. When Aurthur Connor died in 1978, his daughter and son-in-law, Rosemary and Ken Medwell, took up the baton. Ken gave up his career as a quantity surveyor and turned his manual skills and technical aptitude to learning the manufacturing processes. 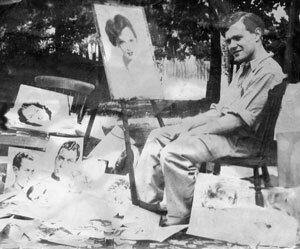 Between them they continued to hand-manufacture the Conopois airbrush to satisfy the demand from elite artists. Ken became an extremely experienced airbrush technician whilst also managing and expanding the business. In the early eighties, Ken and Rosemary moved Conopois Instruments Ltd to new premises, a shop which they named The Airbrush & Spray Centre in Worthing. There they started to sell other art and graphics materials, such as brushes and paint, also introducing a choice of airbrushes to their customers by selling Badger airbrushes. In the mid-eighties they started importing Iwata airbrushes, followed by Paasche airbrushes in 1987. They also serviced and repaired most major brands of airbrush, a service that to this day is still not rivalled by any competitors. Thus the company became known in certain markets as the experts when it comes to airbrushes. The Conopois airbrush gained such a reputation in the graphics world that - when the German graphics products company Rotring decided to get into airbrushes - Rotring sought to buy the manufacturing rights to the Conopois airbrush. In 1988 the Conopois airbrush became mass-produced by Rotring, Ken became a Products Manager for Rotring and Rosemary decided to take a career break. By the mid-nineties demand for airbrushes for graphics was diminishing dramatically due to increasing use of computer graphics. Rotring were heavily into the graphics market and did not venture into the beauty and scale modelling markets as The Airbrush Company does today. So sadly Rotring decided to get out of airbrushes and discontinue manufacturing the unique Conopois airbrush in 1994. Ken and Rosemary bought back the shop premises from Rotring in 1992, forming The Airbrush and Spray Centre Ltd. Rotring had continued selling the Iwata and Paasche airbrushes after buying Conopois Instruments Ltd, so as Rotring came out of airbrushes completely, The Airbrush & Spray Centre picked up distribution for those brands again, also reintroducing Badger to the range. The Airbrush Company still sell all three of those popular brands today. Co-owner Rosemary Medwell returned to work for the company in 1999. In 2001 the company changed its name concisely to The Airbrush Company Ltd and in 2003 moved to an industrial unit to cope with the growth of the company getting into new markets, such as beauty (nails, body art, makeup and tanning). Ken and Rosemary's son, Alex Medwell joined the company in 2003 after finally getting bored and frustrated with his eight-year career in I.T. and taking voluntary redundancy from IBM. Alex has undertaken most roles at some time within his time at The Airbrush Company, proceduralising and streamlining many of the company's processes, expanding the product range, launching the company's top-Google-ranked website Airbrushes.com, purchasing and marketing. He is now the General Manager of company. Alex says, " I never thought I would end up working with my parents (or indeed be able to cope with it! ), but working in a small company with so many roles to fulfil and so many varied markets makes it the most enjoyable and interesting job I have ever had. Now I regret I didn't do this earlier, but I'm pleased to have had my own career first and other experience and skills that I was then able to bring to the company." Since Alex joined the company, The Airbrush Company has expanded its range of airbrush-related offerings, such as several brands of paints including LifeColor Hobby Acrylics and Wilder products, instructional DVDs, accessories and masking tools. The company has grown significantly in another of the company's oldest markets, the scale model market, promoting Iwata airbrushes to the many modellers who increasingly seek the best equipment available for achieving the prefect finish to their models. The Airbrush Company training programme, with tuition contributed by some of their most expert resellers and other customers, is the only programme in the UK to offer customers classes on nearly every application of airbrushing across the main markets, such as art and graphics, custom automotive, scale models, fingernail art, body art, textiles, cakes and crafts. I enjoy helping customers, especially seeing customers delighted with how their airbrush or compressor is performing after I have serviced it. As the family-run Airbrush Company continues to grow it now employs some non-family members. Mike Vose is a long-serving member of the team. Having worked for Ken under Rotring for a number of years previously, Mike returned to The Airbrush Company in 2002. Mike is the company's full-time technician, with thousands of hours experience of servicing and repairing airbrushes and compressors for customers every working day of the week and giving advice on the technical helpline. The company's commitment to technical backup and service is fundamental to The Airbrush Company's reputation for excellent service and expert knowledge. Few competitors offer any service close to this, so Mike is kept constantly busy servicing airbrushes. In 2005, Ian Upton's life-long career as a storeman brought him to a vacancy at an Airbrush Company in need of a hard-working new team member to cope with the increasing workload on dispatch, goods-inwards, and stock control of the expanding range of airbrush related products filling the warehouse. Ian's thorough approach has elevated the Airbrush Company's standards of packing to an even higher level, reducing damages of goods to a minimum. Working at The Airbrush Company means I can combine my daily job with my love of art. Challenges one day become solutions the next with the help of the friendly and efficient team here. Lisa Munro joined in 2006. Lisa studied art and textiles at school and college. She has a personal interest in art and took to airbrushing easily, so she found working at The Airbrush Company to be very intrinsically rewarding. Lisa has been invaluable on marketing projects, promotional literature and producing product images and information on the website, expanding her skill-set all the time. Lisa is responsible for the advertising schedule, designing adverts and communications with the media, such as magazine editors. Her enthusiasm and perseverance make Lisa an asset to the company, and her natural telephone manner make her a pleasure for customers to deal with. Lisa is the tutor for the Airbrushing Papercrafts and Airbrushing Cakes & Sugarcrafts classes. Lisa's airbrushed cake designs have been published in Cake Craft & Decoration Magazine as step-by-step instructional articles. I love being involved in the family business and enjoy the variety in my role. I hope to pass on the family tradition to my son, daughter, niece and nephew as the 4th generation of The Airbrush Company. In September 2012, Ken and Rosemary's daughter Rachael Smith rejoined, having worked for the company previously on airbrush servicing and repair. Rachael has also worked previously as an airbrush artist in the custom painting field. Rachael has taken a very varied role, assisting and covering on sales, order processing, producing marketing material and web images, goods in and space reorganisation, to name a few. Rachael has also taken over the role of Training Coordinator, setting class dates, taking bookings and making sure that everything is in place for the smooth running of each class. It's wonderful working in a creative environment where I can share my passion for art with other team members and customers. Since joining I've learnt to airbrush and I absolutely love it! I also feel lucky to work with such lovely people. Sarah Marshadlam joined on Order Processing in 2015, bringing her calm, organised approach and cheerful telephone manner to the role. Sarah has turned her love of doing art to learning airbrushing at the weekends. Interests: Cooking, Eating, Wine, France. I enjoy giving technical advice to customers. Every day is different. On the subject of where the organisation has reached today, Alex says, "I am now happy that we have a strong team for continuing the success of the company in the future. Ensuring that among our sales, marketing and tech support personnel we have the practical skills of using the products will continue to be our strategy for providing good advice and support to end-customers and our resellers. As a company expert on airbrushes specifically, we have to know a lot about the use of airbrushes generally across many markets. Also as a distributor, we recognise that our specialised resellers can offer more in-depth knowledge of the application of the airbrush in each of their markets that they focus on. So if you buy from one of our authorised resellers you will benefit not just from their knowledge and advice, but also from the technical backup, warranty and advice that we provide." I'm really pleased that we are carrying on a family tradition in the airbrush business. When asked about The Airbrush Company's business model and the underlying philosophy, Alex states "Like all our UK competitors who import other brands, we do sell to direct to the public as well as distribute the products. From the earlier forms of the company, dating back to my grandfather Arthur Connor's entrepreneurial 'cottage industry', hand-manufacturing his own unique design of Conopois airbrush, through the days of Ken and Rosemary's first retail art shop in Worthing and to the present day, we have always been a hybrid retailer/distributor. We have seen a need to maintain this for old loyal customers and new customers alike, because they seek the level of advice and support on airbrushes that The Airbrush Company is proud to offer. The main shift is that we no longer manufacture airbrushes, but have continued the technical and repair service for the main brands. We have so many markets and so many different roles to fulfil between us, it is never boring working at The Airbrush Company. I get to use every one of my skills and both sides of my brain, from the artistic stuff through to the logical stuff. "With a 70 year history in manufacturing, selling and servicing airbrushes, The Airbrush Company know what makes a good quality airbrush, so we only stock the best brands, such as Iwata airbrushes. Airbrushes are our core business, but when taking on new ranges of products like paints or other tools, we like to make sure these are also the best available in keeping with the quality of our airbrush brands. We have had to evolve and adapt as we grew in newer markets. But our business model of being a hybrid retailer/distributor has remained relatively unchanged throughout the years and our commitment to selling only the top quality airbrushes, and the support that we believe customers should expect with it, remains our overriding philosophy." About the future of the company, a project he affectionately calls '4G', Alex said "I have started training the 4th generation to use an airbrush: my son from the age of 4 and my daughter from the age of 2. I'm not forcing them - they asked, 'Daddy, can I have an airbrush?'. I am thinking about the future of the family business now, although I'd never pressure them and I'd expect them to want to pursue their own careers before perhaps finally coming back to The Airbrush Company like I did." Although that was over 10 years ago and Alex's children have been more engrossed in computer gaming than picking up an airbrush very often, Samuel Medwell finally started part-time work at the age of 13. Samuel spent some time processing web orders on Sunday mornings while Alex taught airbrushing to newest staff member Sarah. The family business is still growing and the story will continue.